Terence MacSwiney was born in Cork in 1879. After completing his secondary school education at the Christian Brothers’ School at North Monastery in Cork city, he went to work as an entry clerk at Dwyer and Co, a Cork Warehousing and distribution company, at the age of 15. In 1899, MacSwiney and some friends formed the Cork Celtic Literary Society. The society soon involved itself in political activities, including a dramatic public protest at the visit of King Edward VII to Cork in 1902, during which MacSwiney was arrested. 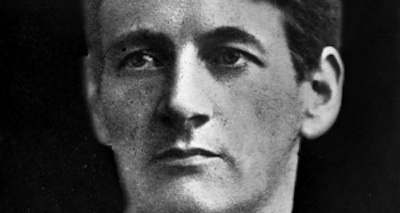 Around this time, Terence MacSwiney developed an interest in journalism and began contributing articles to such periodicals as the Dublin-based Irish Freedom. In 1907, MacSwiney graduated from the Royal University of Cork with a degree in Mental and Moral Science. In 1908, with Daniel Corkery, he founded the Cork Dramatic Society, which performed several plays written by MacSwiney himself. He worked part-time as a lecturer in business methods at the Cork Municipal School of Commerce and later as a commercial teacher and organiser of classes in the towns of County Cork. His work travelling around the county provided him with the background and contacts he would use in helping to form the Cork Volunteers in 1913. In 1914, MacSwiney wrote and published a weekly paper called Fianna Fail, which focused on the republican movement and was suppressed by the state after only 11 issues. He continued to write for other nationalist papers, however, in addition to becoming in 1915, a full-time organiser for the Irish Volunteers with the rank of Commandant. He was arrested in January 1916 for making a seditious speech but was released in February without being brought to trial. In June 1917, MacSwiney married Muriel Murphy of Cork, although he was in prison at the time. Richard Mulcahy, who would later become Chief of Staff of the IRA, served as the best man. Upon his release from prison, MacSwiney and Muriel set up house in Douglas Road in Cork City. MacSwiney was arrested three months later. In all, he would be jailed six times between 1916 and 1920. He saw his baby daughter Maire for the first time when Muriel went to visit him in prison in Belfast. In 1919, Terence MacSwiney was elected to the 32-County Dail Eireann, the newly established parliament of the Irish people which the British refused to recognise, outlawed and drove underground. Meanwhile, MacSwiney continued to serve as Second-in -Command of the IRA’s Cork Brigade, under his friend Commandant Tomas Mac Curtain. Mac Curtain was also Lord Mayor of Cork- until he was assassinated by crown forces on 18 March 1920. On 30 March 1920, Terence MacSwiney was elected Lord Mayor of Cork. The coroner’s jury had found that Mac Curtain’s murder had taken place ‘under circumstances of most callous brutality’, and was ‘organised and carried out by the Royal Irish Constabulary officially directed by the British government”. The new Lord Mayor of Cork made certain that these findings were made public. On 12 August, British soldiers raided City Hall and arrested MacSwiney among other people- IRA Volunteers they did not recognise. MacSwiney proposed that they immediately go on hunger strike. After three days the other Volunteers were released, but MacSwiney was bound over for a court martial. He was charged with having British secret codes in his possession. He was transported to Brixton Prison in London. By the time he arrived he had grown so weak that the prison doctor decided against any effort to force feed him. His hunger strike began to attract world wide attention. MacSwiney wanted to stay alive as long as possible, not only in the hope of that the British might back down, but also to draw worldwide attention to the Irish cause. The British government was besieged with letters urging clemency. Despite huge support for MacSwiney, the British did not relent. Having survived without food for 74 days, Terence MacSwiney, IRA Volunteer, Sinn Fein TD, and Lord Mayor of Cork, died on 24 October 1920, 92 years ago this week.